Windows 10 has some nice features for multimonitor setups. One of which is the ability to display the taskbar on only one monitor. Changing this setting really comes down to preference. Sure, there are some good reasons to keep the taskbar on both monitors. Since the Anniversary Update, for example, the taskbar clock is displayed on both monitors. For gamers or people watching a movie that creates an easy way to keep an eye on the time. Nevertheless, some people prefer the cleaner look of having the taskbar on a single display. 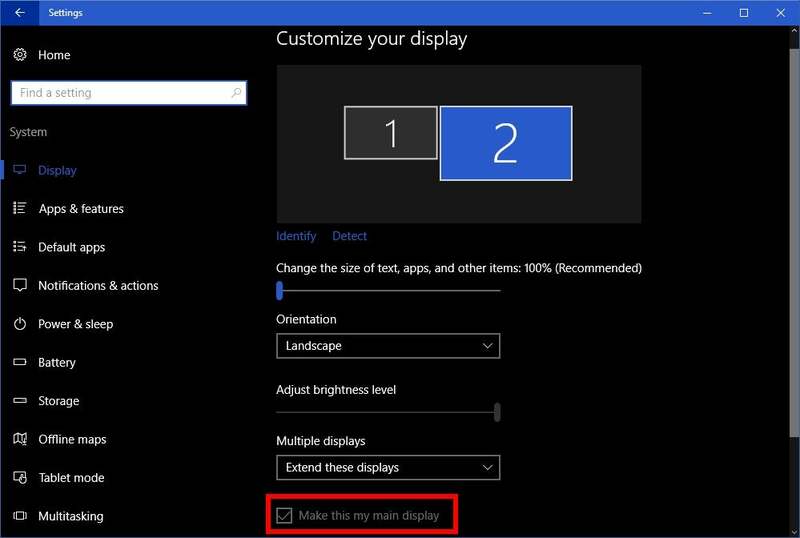 In Windows 10, this is really easy to set up, but first let’s make sure we’ve got the right display chosen as your main monitor. Once you’ve switched, the taskbar will only show up on your primary display. We’ll use my setup as an example. I have a laptop to my left and a larger external display right in front of me. Although the laptop is the actual PC, I set my external display as the primary one. Thus, the main version of the taskbar with the notifications area and the Action Center are where I need them to be. Display settings in Windows 10. Go to Start > Settings > System > Display. In this case, the external display is labeled as 2 and the laptop display is 1. To make 2 my main display I’d highlight it and then check the box labeled Make this my main display. 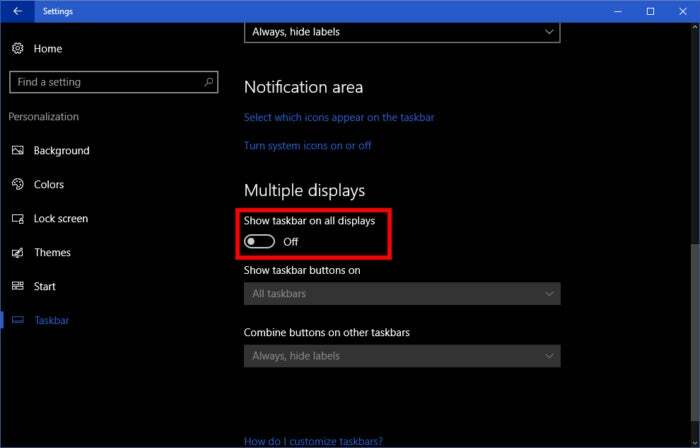 Turning off the taskbar in Windows 10. Now that’s taken care of, go to Settings > Personalization > Taskbar, and scroll down to the Multiple displays heading. Switch to Off the slider labeled Show taskbar on all displays, and that’s it. Enjoy the more spartan look of a single taskbar on your multi-monitor setup.